The Storm Optimus Solid follows in the footsteps of the Marvel Series in terms of benchmark control. The Optimus Solid is moderately priced while offering a benchmark look on medium to medium-heavy conditions depending on the amount of hand you have. The Storm Optimus SOlid is wrapped in the R2X Solid Reactive coverstock and inside is the Tri-Sphere™ Core. The 15 pounder has an RG of 2.48, diff of .048. 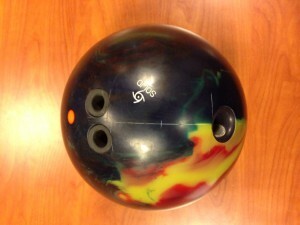 It’s easy to see the Optimus Solid as a medium-heavy condition benchmark ball. It is so smooth due to the nice match up of cover and core. Both want to read the midlane and they do quite well allowing the ball to smoothly roll heavy into the pocket. The smoothness gives it good forgiveness, especially when you are facing a fresh or tough pattern where you don’t want to give away the pocket. It will chew up the typical house shot fairly quickly, especially if you have a lot of hand. This could cause you to lose hit. You could switch the the original Optimus which is pearl reactive. However, the surface is very clean on the pearl so you may want to knock the polish off to get them a bit closer for step down. The Storm Optimus Solid is very similar in motion to the Marvel series with the Centripetal core. Well let me be more specific. The Optimus Solid is somewhere in between the Marvel S and original Marvel in terms of strength. A little less than the Marvel S in overall hook and more backend than the original Marvel. I found the Optimus pearl quite different than the Marvel Pearl but that’s a story for another time. The Optimus Solid is in the vein of the Hy-Road Solid as well but a bit stronger and earlier. The Crux Pearl offers an interesting ball reaction. For anyone familiar enough, you will recognize the typical asymmetrical ball motion which is that more aggressive and angular move off the spot as compared to the smoother reaction of a symmetrical weight block. The polished pearl cover allows the extra foot or so over the original Crux which allows it to store more energy and makes it more usable on medium to medium-heavy volumes. It pairs nicely to the Crux of course as a step down, but I can see bowlers more than likely with the Crux Pearl first out of the bag while the Crux will come out if the Pearl can’t handle the volume. A follow on to the Marvel Series, the Optimus Solid adds that strong smooth midlane reading benchmark ball in the Master Line. It’s primarily for medium-heavy conditions but I’m sure many will be able to use it on typical medium conditions either as is to control fresh or with mild surface changes. It’s a great piece to have when you simply can not give away the pocket on those tougher patterns. Another strong addition to Storm’s successful lineup.